French President Francois Hollande, who has long pledged only run for a second term in office if unemployment was falling, has upped the stakes by saying that fall would have to be sustained throughout the year before the May 2017 vote. The comments to reporters late on Monday came hours after data showed French jobless claims rose to a new record in June, with 3.55 million registered as out of work, from 2.89 million the month before he was elected in May 2012. At his annual dinner with the French presidential press association, Hollande said unemployment would have to fall from the start of 2016 onwards and growth would have to pick up well before the May 2017 election for him to stand. "I hope the unemployment charts turn down by 2017, and well before that date so as to be credible," he said. "Unemployment would need to fall throughout 2016 to make a choice regarding a possible presidential campaign." But in reference to uncertainties still hovering over the economy of the eurozone, whose leaders earlier this month narrowly averted an exit of near-bankrupt Greece, he added: "There are so many uncertainties that this is necessarily a bet, a risk, which I am taking on." 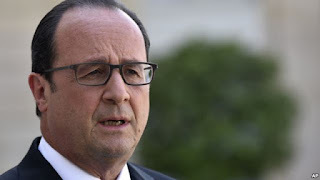 The most unpopular president since the start of France's Fifth Republic in 1958, Hollande has ruled out a change of government policy to restore French companies' competitiveness, as demanded by the left wing of his Socialist Party. The Socialist Party will choose its candidate next year and Hollande, as the incumbent president, would normally have first refusal of their ticket. Manuel Valls, his reformist prime minister, is seen by some as a possible future president but could struggle to win support from the traditional left. In an outlook update published on June 18, the national statistics office INSEE said France's economy would expand fast enough in the second half of the year to halt the rise in unemployment, which stands at around 10 percent. In the eurozone's top economy, Germany, by contrast, the unemployment total fell for the ninth month in a row in June, with the jobless rate holding steady at a record low of 6.4 percent. Henri Guaino, a leading opposition conservative and former adviser to ex-president Nicolas Sarkozy - who is likely to stand himself in 2017 - criticized Hollande's comments. "This is a gamble which is not worthy of a statesman," he told BFMTV.